Yoshida Castle (吉田城) is one of the flatland castle located in Toyohashi, Aichi Prefecture. It was constructed in the beginning of 16th century. 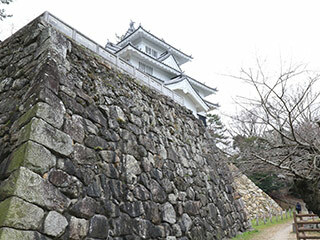 During the Sengoku Period, it was very important castle because it is located in between the land of Mikawa and Totoumi. Most of the time, this castle was ruled by Imagawa clan of Shizuoka. After the fall of Imagawa, it became the castle of Tokugawa Ieyasu. In Edo period, this castle was very important to protect Edo because it is located on Tokaido Road. There are stone walls and bellies and dry moat are remaining in the great condition. The tower: 10:00 to 15:00. 1. use Toyohashi Line to Toyohashi koen mae Station. Built in: the beginning of 16th century. Yoshida Castle is located in Toyohashi, Aichi Prefecture. The record said it was constructed in 1505 by Makino Kohaku who is the Samurai of Imagawa Clan. Imagawa Clan constructed this castle to invade the land of eastern Mikawa. In 1560, Imagawa Yoshimoto was killed by Oda Nobunaga, this castle became Tokugawa Ieyasu's castle. In 1590, Tokugawa Ieyasu moved to Kanto region, Ikeda Terumasa moved to this castle. During Edo period, Yoshida castle was a very important castle to protect Edo because this castle was located on Tokaido Road. There are 4 different bellies and all of them are remaining in great conditions. The stone walls are remaining great. This castle is located right next to the river, therefore it has a small port to enter the castle from the river. It is very unique.